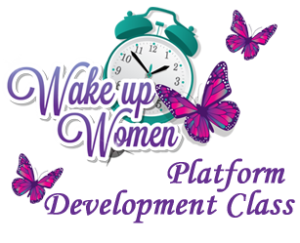 Wake up Women …..Coaching Cafe…..
Is Your Platform Strong Enough to Stand On??? Trying to get your message out without a platform is like standing in a crowded auction with the auctioneer on stage and expecting someone to hear you over all of the activity! Platform development is not just for authors or public speakers. Bloggers, Entrepreneurs, Sales people, Business owners, Singers, Actors, even the top branding managers have a platform. Political campaigns have been won because of a platform. Remember “Hope” and “Change”? In the olden days you could stand on a wooden platform on a hill and be heard. Then the printing presses came along and you could buy advertising in Newspapers, or Magazines or have some noteworthy content written about you. Then with the advent of broadcast media, platforms changed again. Now with the speed of technology today, having a great product or providing uncompromising service or even having a great cause is not enough. or Seen Without a Platform!!! The market place is more crowded than ever. More and more people are competing for the ONE thing that is imperative… how to get someone’s attention. Getting your piece of the pie before the pie is gone is an art, and it will all come down to your platform. That is why you need a platform that is strong enough to stand on, a platform that will put you in front of and above your competition. Today’s market place requires you have a platform that will get you seen and heard in the crowded market place. Today’s consumer is more distracted than ever. We have more of everything, movies, TV channels, social media, websites, blogs, radio stations, podcasts, webinars and webisodes. When social media became the latest craze and all the rage, everybody had access to everyone else, creating a world where everyone has a virtual microphone. Facebook is the most popular site in the world according to Network Solutions. Maintaining a successful business page on Facebook requires a lot more work than a personal page. Every day, more than 600,000 new people join Facebook! If your fan base isn’t growing, you’re missing potential new customers. Using “promoted posts” will ensure your content is being seen. Not just by your fans, but by their friends and family as well, which increases your reach exponentially. Have You Heard of Your LCS Score? By following your LCS Score (Likes, Comments, and Shares) you can tell whether or not your business page is getting more or less effective over time. We will share what we do to keep our LCS score going up every week! Did you know SMO (social media optimization) helps your SEO (search engine optimization)? Together they help your business get to the top of Google search rankings. We will show you how to choose the most relevant category for your business and writing keyword-rich content for your page will ensure you show up when fans are looking for a business like yours. You-tube has been effective in creating stars with celebrity status. Today’s platforms are built to include “Fans” and “Followers” which can lead to contacts, prospects and ultimately paying customers and clients. Wake up Women has built a Facebook following that has put us in 186 countries giving us a global presence spanning many different continents. Wake up women is the only company that has used social media to crowd-source e-books. Building your platform is not just about social media. It’s about perfecting your message and finding the proper audience. It’s about your online and offline presence. It’s finding the events that are right for your message, creating events on and off line with other speakers whose message aligns with yours. A properly built platform can bring you lucrative joint ventures! We have experienced every setback, mistake and headache possible while building our social media platform and presence. With our step-by-step guide and weekly coaching program, you will learn the processes of building a platform that works as well as the things you should avoid. We have built our platform, and can help you build yours. Regardless of what people may tell you, building a platform is easier than you may think, especially if you have the correct tools and techniques. We are going to give you tools you can use, not something in theory or speculative content. Join us for our next Platform Development Class. Get you in tune with your message and your market, both on and off line. Getting the attention of the consumer in a noisy world without a platform is next to impossible. If you don’t have a platform you will be alone in a crowd without a microphone among all these people, and no one will recognize you, and this will leave you as one of the crowd. Our Next Class is Starting Soon! !